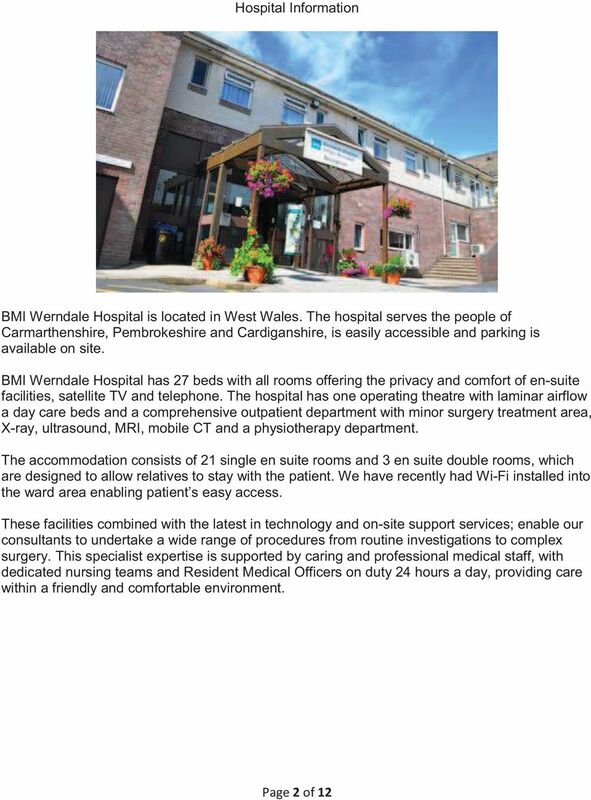 Download "BMI Werndale Hospital Quality Accounts April 2013 to March 2014"
2 Hospital Information BMI Werndale Hospital is located in West Wales. The hospital serves the people of Carmarthenshire, Pembrokeshire and Cardiganshire, is easily accessible and parking is available on site. BMI Werndale Hospital has 27 beds with all rooms offering the privacy and comfort of en-suite facilities, satellite TV and telephone. The hospital has one operating theatre with laminar airflow a day care beds and a comprehensive outpatient department with minor surgery treatment area, X-ray, ultrasound, MRI, mobile CT and a physiotherapy department. The accommodation consists of 21 single en suite rooms and 3 en suite double rooms, which are designed to allow relatives to stay with the patient. We have recently had Wi-Fi installed into the ward area enabling patient s easy access. These facilities combined with the latest in technology and on-site support services; enable our consultants to undertake a wide range of procedures from routine investigations to complex surgery. This specialist expertise is supported by caring and professional medical staff, with dedicated nursing teams and Resident Medical Officers on duty 24 hours a day, providing care within a friendly and comfortable environment. 4 gives patients information to help them choose or find out more about an independent hospital including the ability to search by location and procedure. BMI Werndale is currently undergoing an ongoing programme of refurbishment which includes the following upgrades and replacements- Replacement of medical equipment in all departments New hand wash sinks throughout Patient room upgrades, replacing carpets with hard floors Patient room air-conditioning units BMI Werndale Hospital clinical team liaises with the local NHS Trust specialist groups in relation to Blood Transfusion, recording and traceability of blood and blood products. 1. Safety 1.1 Infection prevention and control The focus on infection prevention and control continues under the leadership of the Group Head of Infection Prevention and Control. 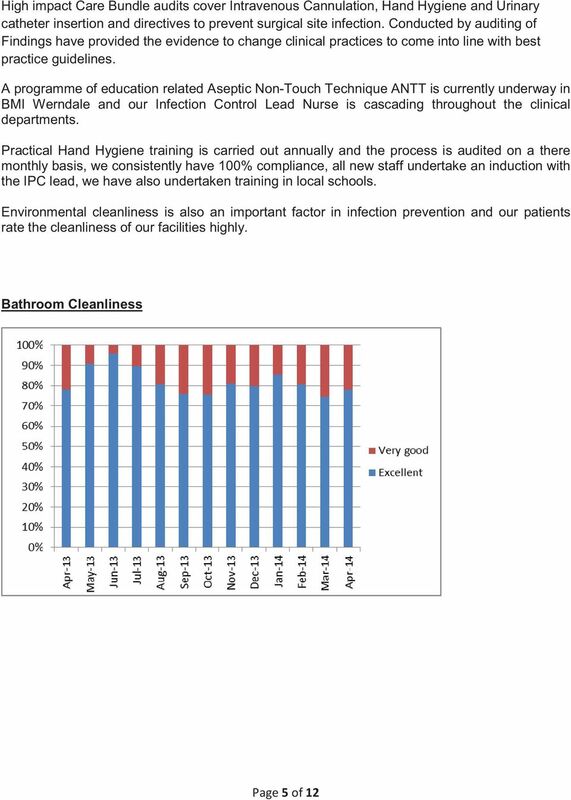 There is a Director of Infection Control in the hospital that is accountable for the implementation of Infection Control Policies and IPC requirements. The Infection Prevention and Control Lead and Link nurses in BMI Werndale Hospital are responsible to ensure these are implemented appropriately. 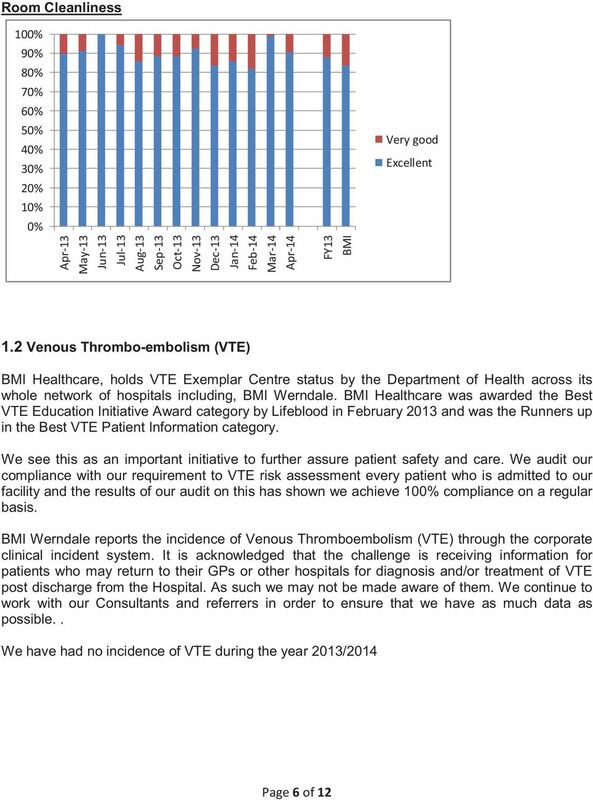 BMI Werndale Hospital We have had: - Zero cases of MRSA bacteremia in the last year (NHS 1.17cases/100,000 bed days). Zero cases MSSA bacteremia cases /100,000 bed days Zero cases E. Coli bacteremia cases/ 100,000 bed days Zero cases of hospital apportioned Clostridium difficile in the last 12 months. 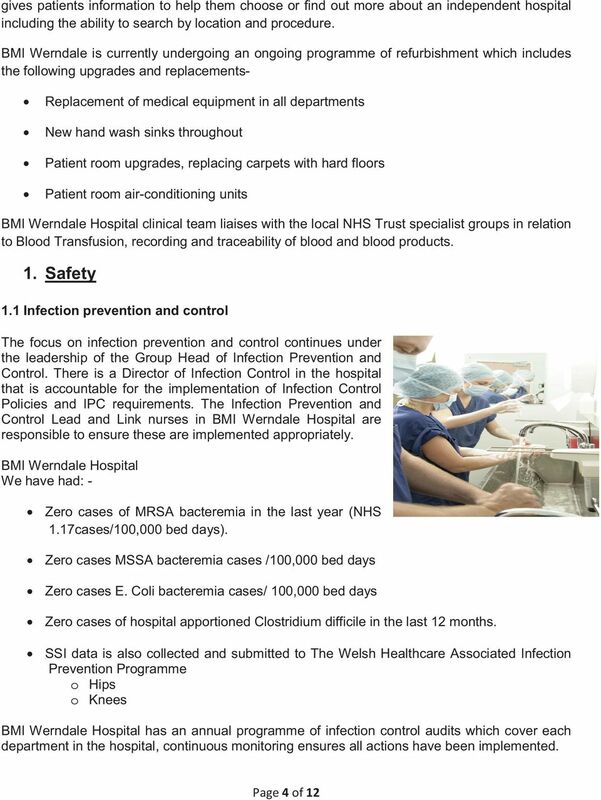 SSI data is also collected and submitted to The Welsh Healthcare Associated Infection Prevention Programme o Hips o Knees BMI Werndale Hospital has an annual programme of infection control audits which cover each department in the hospital, continuous monitoring ensures all actions have been implemented. 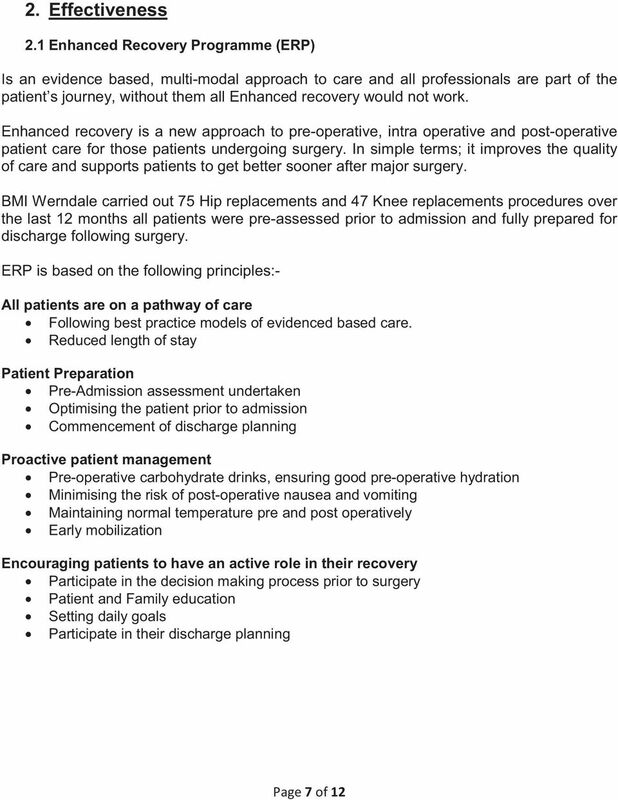 8 2.2 Unplanned Re-admissions within 31 days and unplanned returns to Theatre BMI Werndale had 1 readmission during 2013/2014 and 6 returns to theatre which were due to a clinical complication related to the original surgery. There is a full Theatre team available on an on call system 24 hours a day to provide access to theatre and prompt treatment. 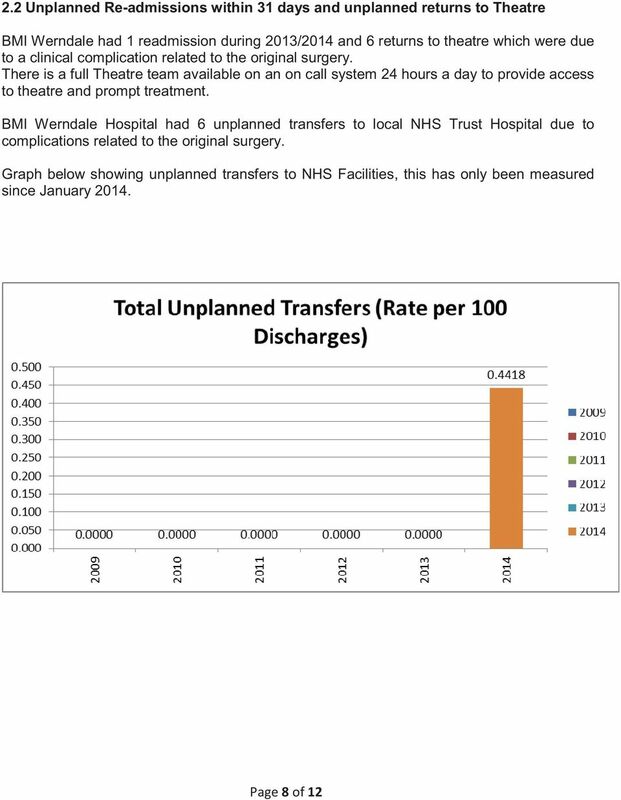 BMI Werndale Hospital had 6 unplanned transfers to local NHS Trust Hospital due to complications related to the original surgery. Graph below showing unplanned transfers to NHS Facilities, this has only been measured since January 2014. 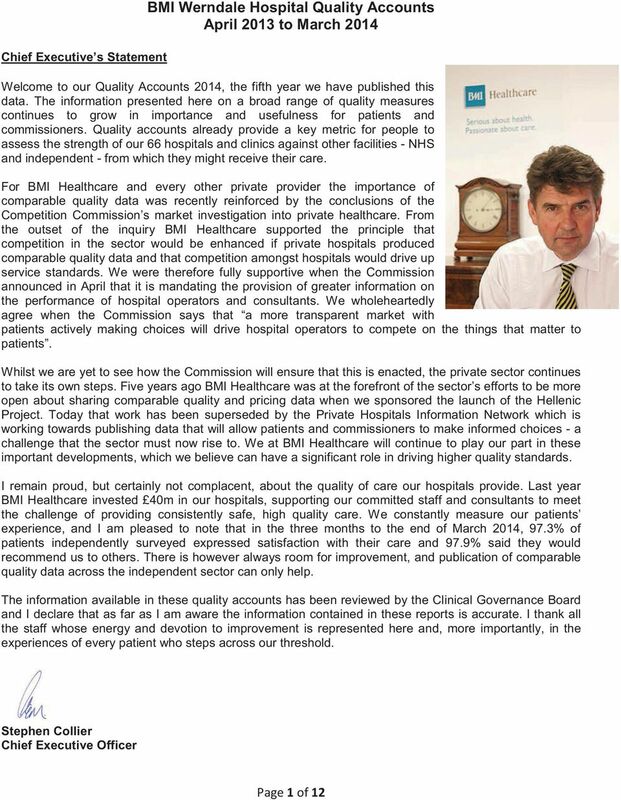 10 On other key issues the patient ratings for the Hospital were as follows (all % good, very good or excellent) Overall impression of the arrival process 96.5% Overall nursing care 97.5% Consultant Surgeon 99.7% Diagnostic imaging 97.4% Physiotherapists 94.5% Pharmacy 97.4% Theatre staff 100% Accommodation 96.8% Catering 98.4% Discharge Procedure 96.7% 3.2 Complaints In addition to providing all patients with an opportunity to complete a satisfaction survey BMI Werndale actively encourages feedback both informally and formally. Patients are supported through a robust complaints procedure, operated over three stages: Stage 1: Hospital resolution Stage 2: Corporate resolution Stage 3: Patients can refer their complaint to independent adjudication if they are not satisfied with the outcome at the other 2 stages. 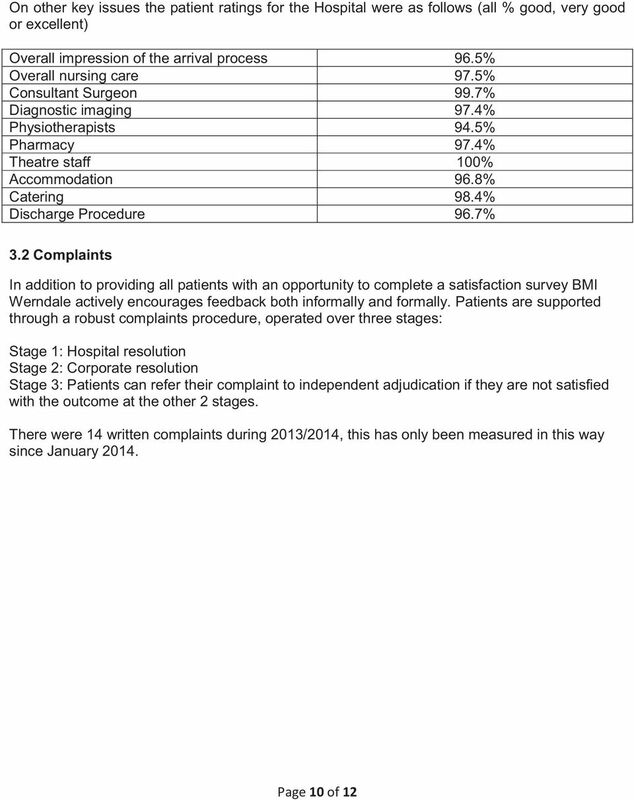 There were 14 written complaints during 2013/2014, this has only been measured in this way since January 2014. 11 We ensure that all patients are given the information via the please Tell Us leaflet which outlines the complaints procedure. We ensure our complaints are readily available for HIW inspection as required. We make every effort to fully resolve complaints within 20 working days. 4. 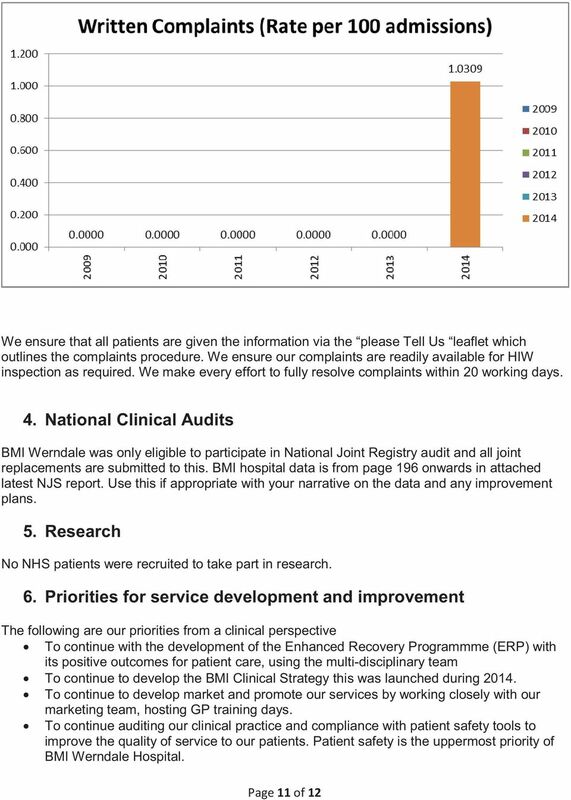 National Clinical Audits BMI Werndale was only eligible to participate in National Joint Registry audit and all joint replacements are submitted to this. 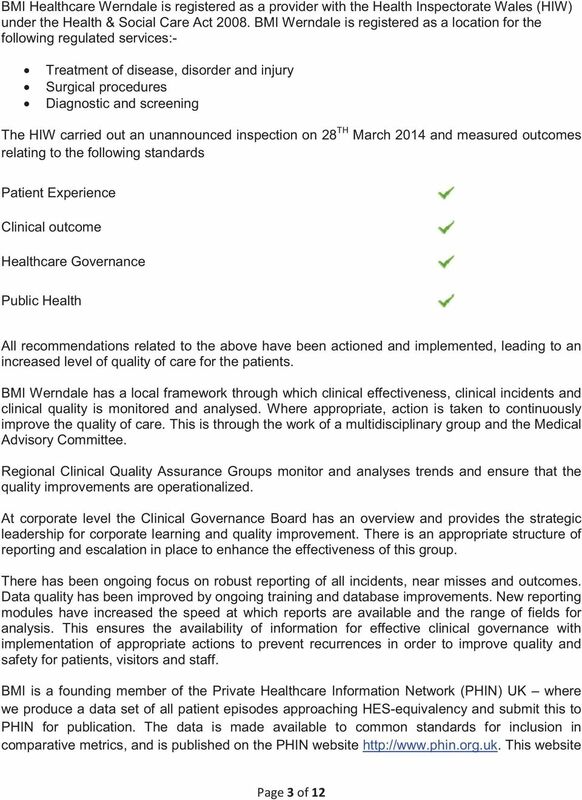 BMI hospital data is from page 196 onwards in attached latest NJS report. Use this if appropriate with your narrative on the data and any improvement plans. 5. Research No NHS patients were recruited to take part in research. 6. Priorities for service development and improvement The following are our priorities from a clinical perspective To continue with the development of the Enhanced Recovery Programmme (ERP) with its positive outcomes for patient care, using the multi-disciplinary team To continue to develop the BMI Clinical Strategy this was launched during To continue to develop market and promote our services by working closely with our marketing team, hosting GP training days. To continue auditing our clinical practice and compliance with patient safety tools to improve the quality of service to our patients. 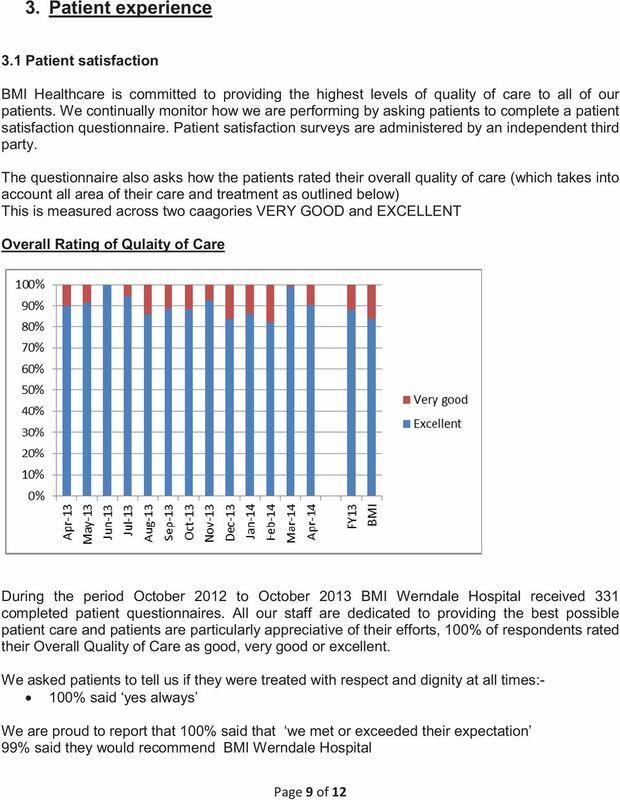 Patient safety is the uppermost priority of BMI Werndale Hospital.